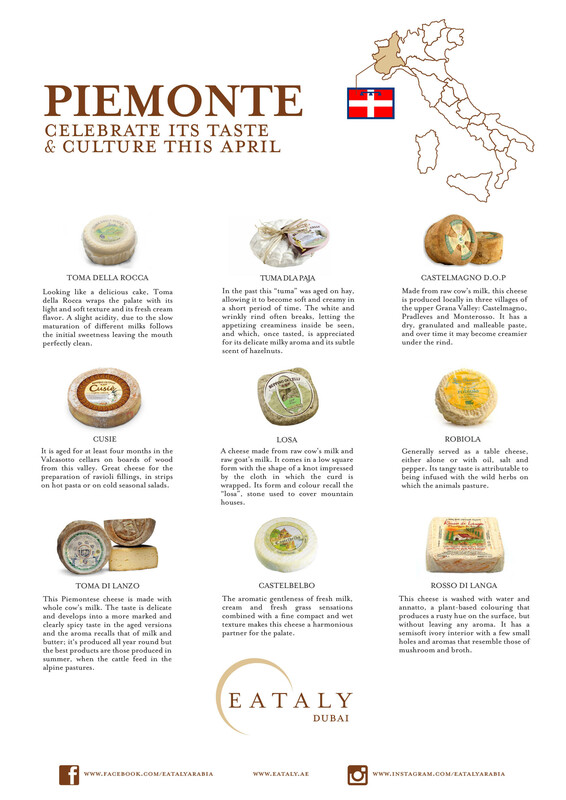 Eataly celebrates the traditional Piemonte cuisine with a special focus on its cheeses. Torino, the capital of Piemonte, is celebrated for rich museums, fashionable car companies, and – most significant for us – the birthplace of Eataly! 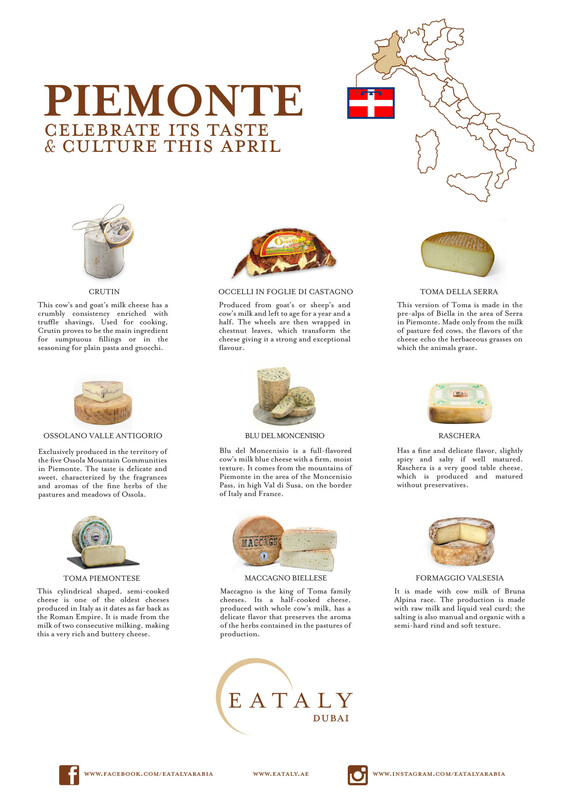 80% of the Italian cheese production is from Alpines areas and the Piemonte mountain pastures and green hills give us a great variety of them and are some of Italy’s most luxurious. In fact, cheese in Piemonte is known as white gold. 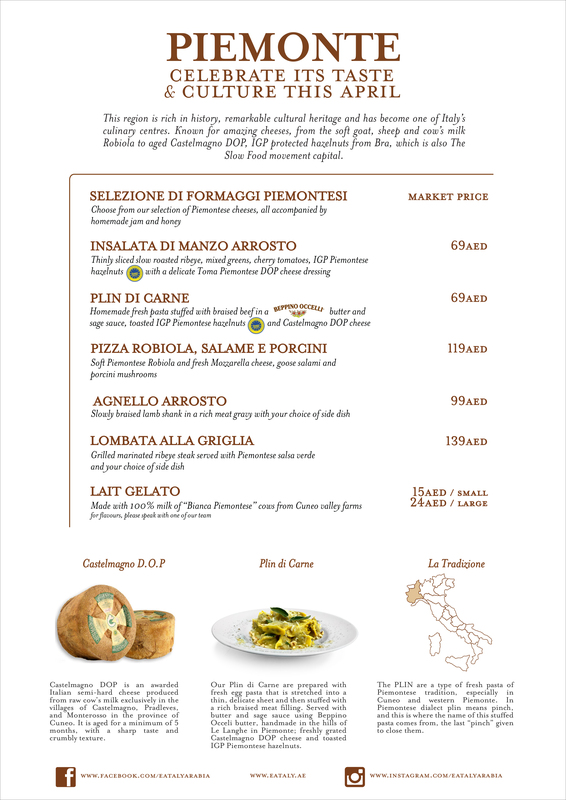 The cheeses of Piemonte are wonderfully mild and creamy, can be fresh or aged and enjoyed in traditional dishes or on artisanal bread and jam. This region is rich in history, remarkable cultural heritage and has become one of Italy’s culinary centres. Known for amazing cheeses, from the soft goat, sheep and cow’s milk Robiola to aged Castelmagno DOP, IGP protected hazelnuts from Bra, which is also the Slow Food movement capital. Eataly: Established in 2007 by former electronics entrepreneur Oscar Farinetti with the aim of making high-quality Italian food available to everyone, at affordable prices and in an informal environment where people can shop, taste and learn. 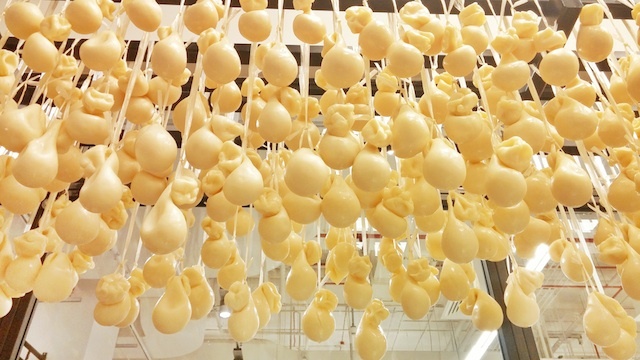 Eataly opened its first 30,000 square feet location in a rundown vermouth warehouse in the Lingotto district of Turin, and has expanded ever since to 27 stores (10 in Italy, 13 in Japan, 1 in New York, 1 in Chicago, 1 in Turkey, and 1 located inside the Dubai Mall in Dubai, which opened its doors in December 2013). “We’re in love with food” and “Food unites us all” are just two of the key philosophies of the Manifesto of the food emporium that combines multiple restaurant stations with a cafe and gourmet farmers’ market.